Fonterra delivered New Zealand’s children– and the country – an early Christmas present by announcing the return to free milk in schools. 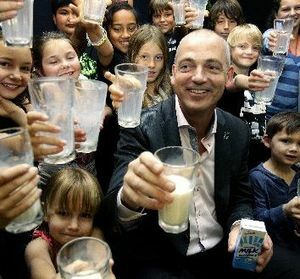 The Milk for Schools programme, which aims to deliver fresh milk to all primary schools nationwide by the start of 2013, was announced by the dairy co-operative in early December. The first to benefit will be 14,000 children from 110 Northland primary schools – which will serve as a regional pilot to test the logistics of the programme. The pilot kicks off in the first term of 2012, with the intention of expanding it to the rest of NZ by the start of 2013. Already the early indications are that the Northland community will strongly support the pilot scheme. The company intends to roll out the scheme nationwide, but hopes to get other companies in the packaging, logistics and refrigeration industries on board. It also hopes to interest the Government in contributing in some way to the costs. Fonterra has not disclosed the costs of a national programme saying these have yet to be worked through. No matter what it costs, the payback for Fonterra and the dairy sector in general is – as the MasterCard advertisements say – priceless! The move comes at a good time for the company, which has copped criticism from consumers for its high domestic milk prices. Fonterra has linked the strong dairy prices at home to robust returns it is getting from international dairy markets, because it pays its 10,500 farmers a single price for milk supplied. Consumer NZ head Sue Chetwin – who has led the public charge over local milk prices – has welcomed the move. Even firebrand Northland Maori MP Hone Hawawira – not normally associated with praising corporates or those who do well in life – was quick to acknowledge the good this programme will do. Child health advocates, teacher unions and editorial writers up and down the country have all praised the scheme. One of the few critics has been the Green Party – which proves when it comes to the sector the only thing green about the Greens is the anti- dairy industry bile they continually spew– claiming it was little more than a glorified PR stunt and not something that a ‘profit-driven corporate’ should be doing. There is no doubt the Milk in Schools programme is a PR stunt. But so what? It is delivering a benefit to kids and shows that Fonterra is an integral and committed part of New Zealand’s community. What the Greens and other critics hate about this scheme is that it shows that companies – even huge ones like Fonterra – can and do good things for more than just our economy. It’s called corporate citizenship. Fonterra recently turned 10 years old and this latest move shows it is growing up and wants to play a positive part in New Zealand’s wider society. Most New Zealanders will welcome this move. It shows that the milk of human kindness – pun intended – is not the sole domain of anti-establishment types, whale saviours and/or tree sitters. Why the Country stayed true blue! So the votes have been counted and we know – or at least, we’re well on the way – to knowing what shape our new Government is going to take. 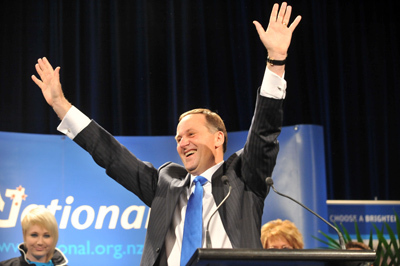 It was always going to be a fairly safe bet that the booths in rural New Zealand will have mostly punted for Prime Minister John Key and the National Party. And the results show – as in the rest of New Zealand – they certainly did. However, much of this rural support for National is probably more by default than desire. Some rural votes did go to ACT – most likely in support of former head Fed and its agriculture spokesman Don Nicolson. However, that party’s ugly struggles throughout the campaign will have scared many off. There were a couple of pockets of organic-supporting, hippy types in the country who went Green. And even some strong rural support – more than likely those farmers plagued with early stages of senile dementia – for NZ First and its Lazarus-like leader Winston Peters. It was also pretty safe to assume that both the Maori and Mana parties will not have garnered too much support in the rural hinterland – save for Northland and the east coast of the North Island. Meanwhile, Labour’s electoral drubbing in 2011 was never more pronounced than in rural and provincial New Zealand. It copped an absolute pasting in the countryside. The party’s ever-so tenuous advances for the farming/rural sector vote probably died about the same time it released its election manifesto. The prospect of being lumped with higher taxes, having agriculture dumped into an ETS, landed with a new capital gains tax; as well as commercial charges for irrigation and extending working for families for beneficiaries will have been an anathema to most in the rural heartland. National made a sensible decision by ruling that agricultural emissions will only be included in an ETS when and if practical technologies are available to enable our farmers to reduce their emissions and more progress is made by our trading partners to reduce their agricultural emissions. National will have also strengthened its rural support with its proposal to pump $400 million into boosting on farm-water storage and irrigation. Not surprisingly, the idea was shot down by its political opponents. But, again, the rationale for this opposition seemed more based on ideology than any sound policy reasons. Much of this opposition stemmed from the idea of funding for these schemes coming from the Future Investment Fund – which will use the proceeds from National’s part asset sales proposal. While Labour and the Greens and NZ First may have problems with where this funding is coming from; surely even they can’t argue with the concept of creating a more reliable source of water for farmers will in turn mean higher productivity and income for the nation – in turn leading to more tax and jobs! Reliable water means growth – both for our economy and the environment. All political parties – no matter if they are left, right or just plain bonkers – should have been supporting such a plan. Those are just a couple of reasons why the countryside stayed true-blue this election!